There are many character combinations. 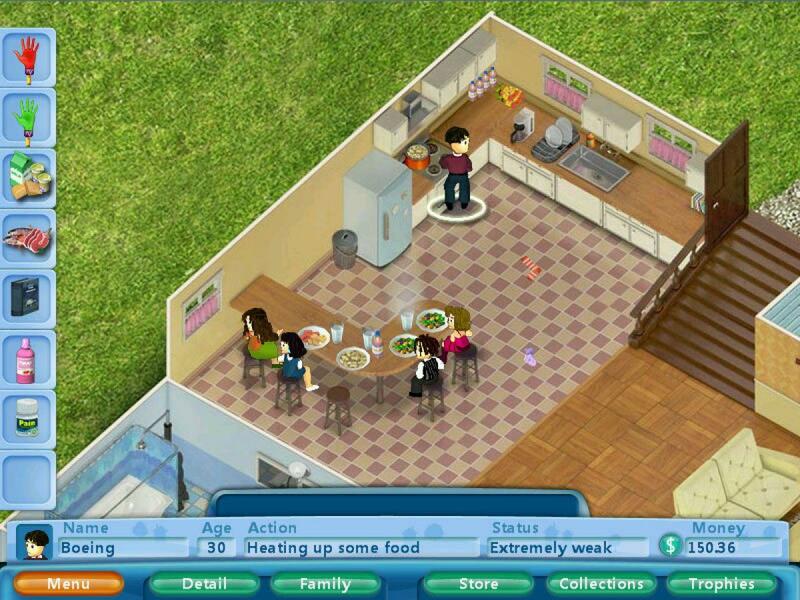 If you are familiar with the Sims, you will definitely like Virtual Families. In this virtual world, you have the responsibility of taking care of a family living in a nice little house with two bedrooms, a bathroom, a kitchen room, office, workshop, living room, garden, and a laundry room. There are plenty of options for you to check out throughout the game. You get started by adopting a character. You can choose the gender of your character. You are a child and you need a family. It is your job to create a family for this child. If you don’t want to be a child, you can choose an older character to start off with if you wish to. In this case, you will have your own kids instead of being a kid. The family you create is completely up to you. You are not forced to always have a married couple with happy kids. You could also go for single parents or other non-traditional family types. The style of family completely depends on your preferences. You can either conjure up an idea or you could simply follow replicate the family situation you presently live in your real life. The personality of the character you build is also your choice. You have many personality options to make things easier for you. You can choose interests, dislikes, appearance, occupation, and so on. This means that the virtual world allows complete customization of your character. Here, you can either make him/her just like you are in real life or you could make him/her just like you always wanted to be. Once you are ready with your character, your responsibilities will begin. You will have to start making money, have kids, watch them grow, meet new people, build relationships, and so on. Your motto should be to keep your family happy and content. Only when you assure that will they be able to live as a family for long. Remember that this is a social world that encourages interaction. You will even get marriage proposals from the other characters! You can accept or reject based on your preferences. Make sure you choose the right partner based on his/her personality so that you gel well. You might also want to look at the occupation of your partner. Some jobs fetch a lot of money that could help you give your family a better life. However, you should also think about the compatibility factor. If you are not compatible, you will end up fighting. Weigh your options and priorities before making a decision. Once you have your own children, you can either stop or continue playing into the next generation. You can go on for multiple generations like that and compare them with your friends. Here, you might get competitive and that will lead to some fun and excitement. You can upgrade your home to make it look better when you have enough money. You can work to build the best home in Virtual Families! The best part is that you have just too many customization options to choose from. If the thought of taking care of a family and keeping it happy interests you, you will love Virtual Families. The virtual world is affordable especially when compared to the Sims and has numerous options to engage you. 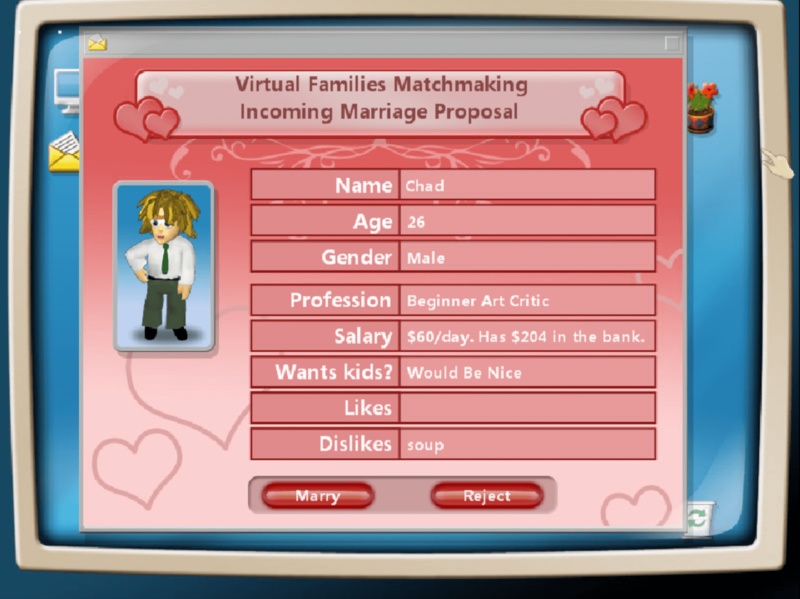 Virtual Families is free to play.